"Borgman" started as a 35 episode TV series in 1988. To combat evil undead monsters, two men and one woman become Borgmen. Borgmen are the ultimate humanoid cyborgs created by a female scientist, named Memory. I never saw the series and it was never released in the US, so I can’t comment on it. Clips from it are shown at the end of "Borgman Last Battle". The Borgmen are Ryo, Anice, and Chuck, plus one cool looking Borgman gone bad, Dust Geed. 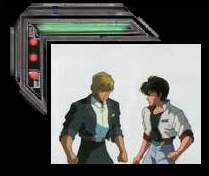 Before "Borgman Last Battle" even starts, Memory is already dead, and the team is split up; Chuck is living in Tokyo with his police girl friend Miki; Ryo is working for NASA in the US with his girl friend Anice. Anice becomes tired of flipping burgers at the local fast food joint, while Ryo plays with some giant NASA space shuttle. She decides to leave Ryo, and goes back to Tokyo looking for better employment. When she arrives she meets her new employer. He turns out to be a mad scientist who wants to repopulate the planet with cyborgs, and takes Anice hostage. Ryo, Chuck, Miki, and Ryo’s friend (whose name I can’t remember) embark on a rescue mission to save both Anice and the world. ADV should have released the series. In "Last Battle" all the characters go into uncontrollable fits of crying when they think of Memory, who never appears in the cartoon, because she’s already dead. There also isn’t much in the way of character development because you’re already supposed to know the heroes from the series. In "Borgman Last Battle" the animation wasn’t bad and the fight scenes were exciting.